A lightweight head torch that doesn't compromise on functionality. The SEO 3 features Smart Light Technology™ for switching quickly between high and low power and a signal mode. It boasts three white LEDs and one red LED housed in a swivelling head for flexibility. A helpful carabiner clip allows for carrying on the go. At only 3.4 ounces, this might be the most versatile head torch you'll own. Smart Light Technology allows you to program your light functions to the task at hand. Three light functions (Power, Low Power, and Signal) are easily operated with full or half clicks, ensuring your focus will be on the job, not on your light. Transport Lock Mode: Press switch for approximately 5 seconds to activate. In this mode the SEO 3 cannot be switched on, either intentionally or unintentionally and inadvertently consume energy. Included: The SEO 3 comes complete with headband, built-in carabiner hook, 3 x AAA batteries and a User Manual. 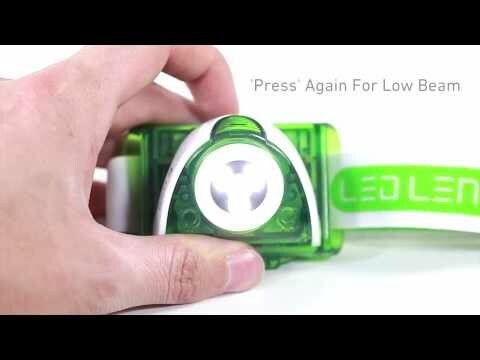 The LED Lenser SEO 3 LED Head Torch (Green) is supplied with a 5 year warranty.